Panasonic is pleased to announce the development of the world's first* twin digital interchangeable lens. The revolutionary new accessory will make high quality 3D shooting possible with an interchangeable lens system camera for the very first time. As 3D content becomes increasingly popular across a variety of platforms, Panasonic plans to release this new lens for sale before the end of the year to deliver the joy and excitement of 3D shooting to interchangeable lens system camera users. The introduction of the 3D lens aims to respond to demands of consumers who want to enjoy 3D shooting for themselves whilst also expanding Panasonic�s range of 3D products. The lens will allow users to capture images in 3D which can then be viewed back using 3D-capable VIERA televisions in the comfort of their own home. Until now, 3D shooting with an interchangeable lens system camera has only been possible by using panorama systems or a combination of two lenses and two CCDs, but these systems have drawbacks including the need for a dedicated 3D camera and the difficulties of capturing moving objects. 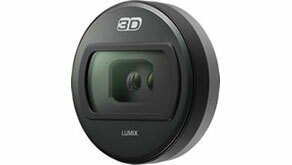 Panasonic's new 3D lens for the LUMIX G Micro System features two optical systems installed within the diameter of the lens mount, creating stereo images from the left and right lenses, to be processed with a 3D image processing system. Thanks to Panasonic's advancements in optical technology, image processing system, and lens barrel design, the 3D lens still manages to retain an extremely compact size. This new compact 3D-capable interchangeable lens allows easier handling and instant 3D shooting, producing 3D images without distortion or time lag between left and right images, even for moving objects. Through expanding its range of 3D products, Panasonic will continue to lead the industry by bringing a true-to-life 3D experience to its customers.